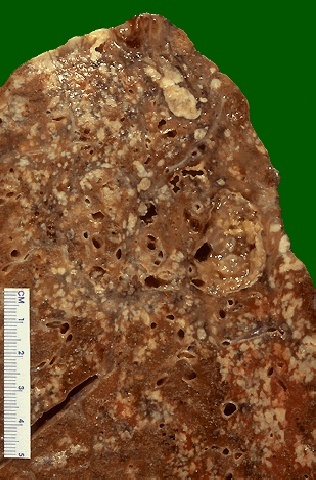 On closer inspection, the granulomas have areas of caseous necrosis. This is very extensive granulomatous disease. This pattern of multiple caseating granulomas primarily in the upper lobes is most characteristic of secondary (reactivation) tuberculosis. However, fungal granulomas (histoplasmosis, cryptococcosis, coccidioidomycosis) can mimic this pattern as well.